This Good Friday, it was more than 150 years since Abraham Lincoln’s death. Had he lived to finish his second term, the history of the United States would no doubt have been far different. Some historians believe that if Lincoln had lived, he would probably have been more successful in making the former slaves free indeed. But Lincoln was dead. Good Friday is the day when Another died–One who did not remain dead. If Christ Crucified had remained in death, history would have been different too–and all eternity with it. “But now is Christ risen!” Of this we are assured times without number in God’s inspired Word. As Easter is meaningless without Good Friday, Holy Week has no comfort without Easter. Both belong together. A much-used story tells of a Muslim who came to a Christian missionary after an open-air service in a village in India. The Christian Easter festival is a victory celebration, proclaimed again in thousands upon thousands of churches, great and small, and echoed in many tongues by choirs and congregations. At the end of the First World War a prominent Protestant church in a large city placed on its illuminated bulletin board these words of St. Paul: “Thanks be to God, who giveth us the victory.” What an abuse of the words of Scripture! True, God alone gives victory. But in the great resurrection chapter from which these words are taken the apostle is not speaking of a victory of the Allies over the Central Powers or of any other war among people. “14 And if Christ has not been raised, then our preaching is in vain and your faith is in vain. 15 … 17 And if Christ has not been raised, your faith is futile and you are still in your sins. 18 Then those also who have fallen asleep in Christ have perished. 19 If in Christ we have hope[a] in this life only, we are of all people most to be pitied. 20 But in fact Christ has been raised from the dead, the firstfruits of those who have fallen asleep. 21 For as by a man came death, by a man has come also the resurrection of the dead. 22 For as in Adam all die, so also in Christ shall all be made alive” (1 Cor. 15). That’s the great difference His resurrection makes. No one can tell this better than St. Paul. Even though he had been indifferent to the crucifixion and resurrection of Jesus of Nazareth, even though he had opposed Him and persecuted His disciples, when he saw the risen Lord on the road to Damascus, he became His greatest ambassador. With Peter, James, and John and the other formerly so timid apostles, Paul in his missionary journeys now proclaimed Jesus Christ the living Savior and showed forth the power of Jesus’ resurrection. One of the biggest turning points in my life took place in August 2000. I was invited to an international conference in Switzerland on conflict resolution and Christian-Islamic dialogue. I gave a speech to about five hundred people from fifty-four nations on my work in Lebanon (the Middle East) and how I was transformed from a militia “kid” to a peacemaker. I was given a standing ovation twice, with tears in the eyes of many. Scores of people lined up to shake my hand. I went back that night to my room thinking of the “glorious” moments of the day, and the big promising future in neutrally representing the repentant Lebanese former militiamen in international conferences. I decided that night that when I went back to Lebanon, I would tell my praying partner, an American missionary living in Lebanon, that I did not want any part of Jesus or the Bible anymore, and that I was satisfied with the way I was. I had been wrestling with following Jesus then for twenty years with nothing but shame and headaches in my Muslim community, I thought. I would tell my missionary friend that I had the full respect towards the teachings of Jesus the peacemaker, but not the Savior. I went to bed that night with that determination in mind, but saw Jesus Christ in a vision. I saw two huge slabs of rock that parted, and He came out from a grave the size of a castle, fit for the King of Kings. He came out in His shrouds. He pointed his finger at me and told me to keep on praying. When I denied Him, He came to the rescue. I flew back to Beirut, Lebanon, submitted my resignation, and decided to serve the Lord the rest of my life. The resurrected Jesus’ power transforms and gives power. Does the knowledge and conviction of the resurrection of Jesus Christ from the dead make any difference in our church and world today? While we see a lot of divisions among Christians in the West, the Holy Spirit is moving mightily among Christian communities in the Middle East. Wars waged in the name of Allah and human disasters are bringing many Muslims to their knees. It is estimated that hundreds of thousands have confessed Jesus Christ in the last decade, compared to a few who had converted before in 1400 years of Islam. Some years ago, we baptized a Lebanese Muslim woman. She had come to Salam Christian Fellowship services for years, went to Bible studies, but was still a devout Muslim. One day she came and asked to be baptized. I asked her: “What happened? I thought you are impervious to the teachings of Christ.” She replied: “I compared the followers of Jesus Christ and the followers of Muhammad. While the followers of Muhammad came out of Arabia, conquered many nations, built empires, massed fortunes, and enslaved thousands of people.…the followers of Jesus, after they saw the resurrected Christ, they came out of Jerusalem preaching the Gospel all the way to Rome, dying under persecution, dying under the sword, but never revoked Christ. I want what they had- the Resurrected Christ and His power over death and sin. Christ gained victory on the cross, we just need to claim it and share it with the world. Many “Easter Christians” will show up on Easter Sunday, and may not come back until Christmas. We need to love them to Christ. Thus our Easter will be a continuous festival. It should be a weekly observance. 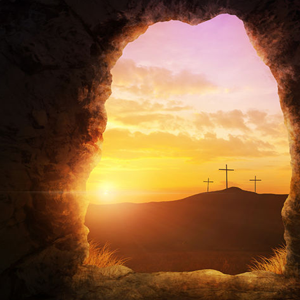 The early Christians chose Sunday for worship because on that day Christ rose from the dead. They used the symbol of the cross in order to signify their faith in the risen, living Lord. Every day in our life should be an Easter day with a funeral and a resurrection. When by daily contrition and repentance our old Adam is drowned and dies, a new man or woman will daily come forth and arise [forgiven], who shall live before God in the righteousness and purity of Christ—now and forever. Indeed, Easter Day is every day! What a difference Christ’s resurrection makes!